Sound Blaster or 100% compatible Sound card. On their return from Peru, some explorers have been struck down by a bizarre illness. The cause is rumoured to be a mysterious mummy... When Professor Calculus disappears in strange circumstances, Tintin decides to investigate. From the port of Westermouth to high up in the Andes, he will need to solve riddle upon riddle if his enquiries are to continue. Your adventures in the land of the Incas will be full of tough mental challenges and packed with action. So are you ready to visit the Temple of the Sun? True to Hergé's comic books, "The Seven Crystal Balls" and "Prisoners of the Sun", both in terms of story-line and graphic detail. Yet more animations and possible actions: take items, push them, throw them, trigger off mechanisms and much, much more. Game in 4 languages: english, french, german, spanish. True to Herge's comic books. Both in terms of storyline and graphic detail, this game is rich and varied gameplay. Full of action and brain-teasing puzzles. 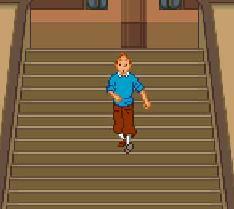 Kids will love this game and so will fans of Tintin.